Last year, I gave you my tried and true shortbread recipe. This year, I experimented with a new fun project: Tecate Cypress-infused bourbon. Infused whiskeys and bourbons are all the rage of do-it-yourselfers and of artisanal restauranteurs. The idea is to take stems, greenery, berries, flowers or other plant parts and allow them to transfer flavor to a favorite spirited liquor. Before you think about trying this at your place: warnings and caveats! Caveat One: Never put anything in your mouth that you think you have the slightest chance of being allergic to. We are not suggesting that this is 100% safe for you. Call the Poison Control Center Hotline (which I did before I started my experiment) and talk to one of their experts. Call 1-800-222-1222. Caveat Two: Don’t forage wild plants. Please grow your own, and forage your own garden, or ask permission to pick from someone else’s garden. Caveat Four: You may not like these sorts of flavors, so test this out in small batches before you go using up all your expensive supplies. Here is what I did. 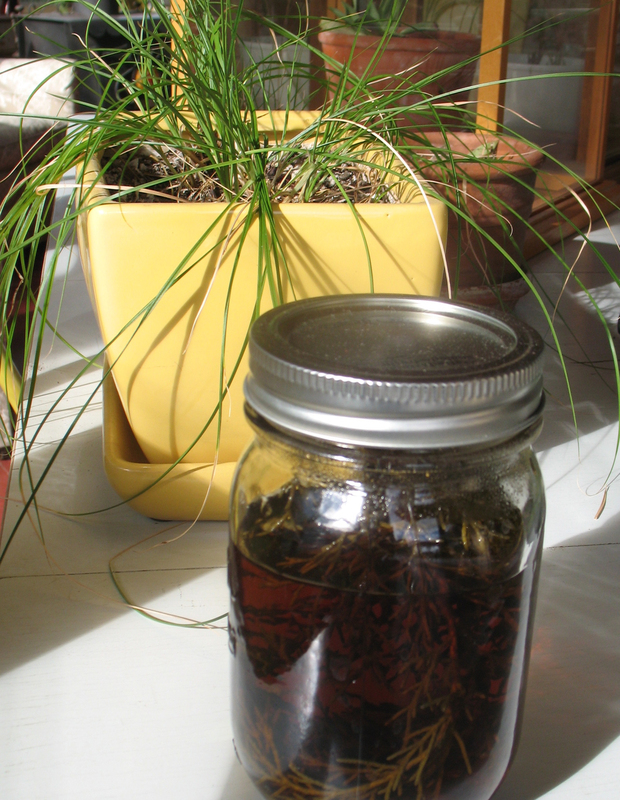 I took a small sprig of Tecate Cypress (Cupressus forbesii, now called Hesperocyparis forbesii) – about seven inches long and stuffed it into a quart Mason jar and filled it with bourbon. I set it on my counter in my kitchen and let it seep. Every once in a while I took a sip to see how it was coming along. Many online resources say this takes about two weeks, but after about eight days, I felt the flavor was strong enough to make an impact. If I had found the flavor to be too strong, I would have simply diluted it with more spirits. But it is just fine. It tastes slightly resinous. Just like it smells. I love it. For our family get-together on New Year’s Day, we swap under $10 gifts and the theme this year is to bring a gift that has a connection to wherever the person comes from. So, my little Mason jar of Tecate Cypress Bourbon is gonna be a hit, I am sure. I do plan to put a cute label on it, in the holiday spirit, excuse the pun. If you see any members of my family before the gift exchange on the 1st, don’t let on. This is a surprise. This entry was posted in Edibles, Native Plant Recipe, Uncategorized and tagged recipe. Bookmark the permalink. Susan, thanks for this article. I didn’t have Cupressus forbesii on hand, but tried using Salvia spathacea instead. The results were interesting.